MindMixer builds better communities by involving people in things they care about. It began in April 2011 as Iteration Zero with a 30-day timeline and a small budget. A couple co-founders, an investment partner, the initial UX framework and myself set out to create a platform for cities to gather ideas from citizens. The initial application allowed people to open accounts and respond to questions on a host of topics community leaders wanted feedback on. The journey over the next three years included success, failure and a lot of learning. The following screens are some highlights in various phases of the product offering; the participant experience, the client experience and the overall story we were trying to tell. On MindMixer, citizens can interact with community leaders in an open, online conversation that’s approachable and convenient. Whether communities are talking about transportation in Los Angeles, local food in San Francisco, bike projects in Omaha, campus character at Kansas State University or agriculture in North Dakota, all ideas are welcomed, discussed, rated and the best ones put to use. An ever-evolving app design with a consistent flow of new features, new ways to engage participants, community-focused iconography, color themes and infographics. All features and assets are designed to give communities an easy-to-use tool that’s both enjoyable and effective. The final part of the MindMixer platform is a democracy forum for the state of Arizona. 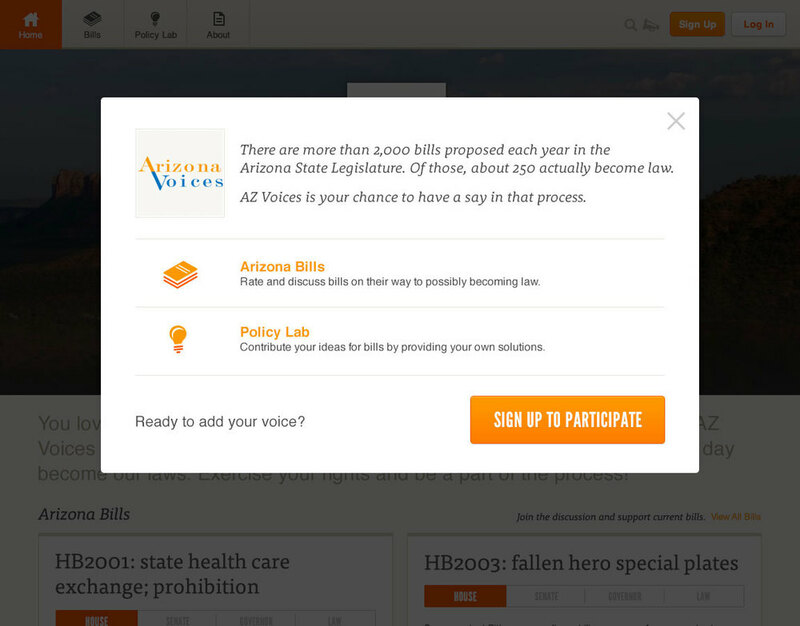 AZ voices allows citizens to have their say in the creation of bills in the state legislature. Rate and discuss current bills or contribute your own solutions to problems in the state. Content is presented clearly and without distraction. We cut down on clutter, allowing you a singular focus from mobile up to desktop. Engagement is always accessible and contextual. Each listing and detail page is clear and heirarchial in what you’re suppose to do. Interactions are appropriate. You can quickly add your thoughts, or take more time to craft your ideas. Sharing helps the community grow. We want it to be easy for you to share content on the site. The journey for me ended in early 2014 with 700 organizations having used MindMixer in some capacity. As the company grows and moves into its next iteration, it will undoubtedly continue to help cities improve community engagement. A collaboration with the MindMixer team.